The much awaited judgment was finally delivered by Special Judge Shyam Lal of a Special CBI court which held the doctor couple Rajesh and Nupur Talwar guilty in connection with the murder of their teenage daughter Aarushi and domestic help Hemraj at their Noida residence in May 2008. The couple have been convicted under Sections 302 (murder), 201 (destruction of evidence), 34 (common purpose) of the Indian Penal Code. Dr. Rajesh Talwar has also been convicted under Section 203 (misleading probe) for filing a wrong FIR with the Noida Police. Soon after the judgment, a statement was issued by the Talwars expressing their disappointment over the verdict. After the verdict, the two were taken into custody. Arguments on the quantum of sentence will be heard by the court on Tuesday. 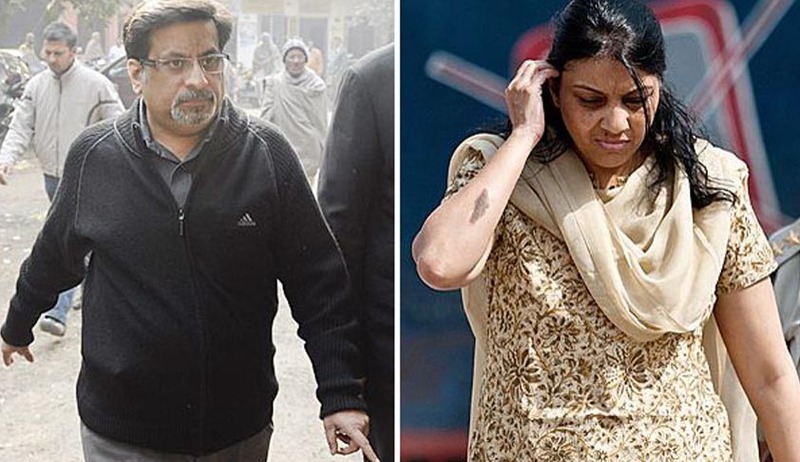 Going by circumstantial evidence, testimony of witnesses and forensic reports, almost five-and-a-half years after the sensational double murder was committed, the CBI Court pronounced the accused Rajesh and Nupur Talwar guilty of being the killers of their daughter and domestic help Hemraj. On the morning of May 16, 2008, Aarushi was found in her room with her throat slit. The case took a mysterious twist when the body of domestic help Hemraj was found dumped on the terrace a day late. According to Aarushi’s dentist father Rajesh Talwar, Hemraj was the one who had murdered her daughter. Investigation which was taken up initially by the Uttar Pradesh Police failed to discover Hemraj's body, which cast a shadow on their findings that it was none other than Dr. Talwar who had killed both his daughter and the help “after they were found in an objectionable though not compromising position”. The case was later transferred to the Central Bureau of Investigation which, within a month concluded that Dr. Talwar's assistant Krishna, in connivance with his accomplices Raj Kumar and Vijay Mandal, had murdered the two following a failed attempt to sexually assault Aarushi in an intoxicated state. On December 29, 2010, the agency citing inadequate evidence against the Talwars filed a closure report that highlighted both the mitigating and the aggravating facts. The closure report was rejected by the special CBI judge and summoned both parents as accused for murder and destruction of evidence on the basis of statements and circumstantial evidence cited by CBI. The court refused to allow closure and instead found sufficient material in the report to frame charges against the dentist couple. The duo were charged with offences of murder and destruction of evidence, and an additional charge of misleading the investigation was invoked against Rajesh Talwar for filing a wrong FIR with the Noida police claiming that his domestic help Hemraj had murdered his daughter. Many applications were filed by the Talwars for over a year in lower courts, Allahabad High Court and Supreme Court, seeking relief against the charges and rebutting the charges. However, Supreme Court asked them to join the trial as soon as possible. Meanwhile, the CBI filed many applications in court seeking to send Nupur Talwar to judicial custody since she had been summoned as an accused. On April 30, 2012, she was sent to Dasna Jail, but on September 17 that year the Supreme Court gave her bail. The dentist couple, during the past 19 months of trial, has maintained that they have not killed their daughter and servant and that the CBI's conclusions were based on presumptions and not confirmed or supported by true and actual facts. They even claimed that the CBI's charges against them showed intentional lapses in investigations and called the investigations as tainted.